November 15. 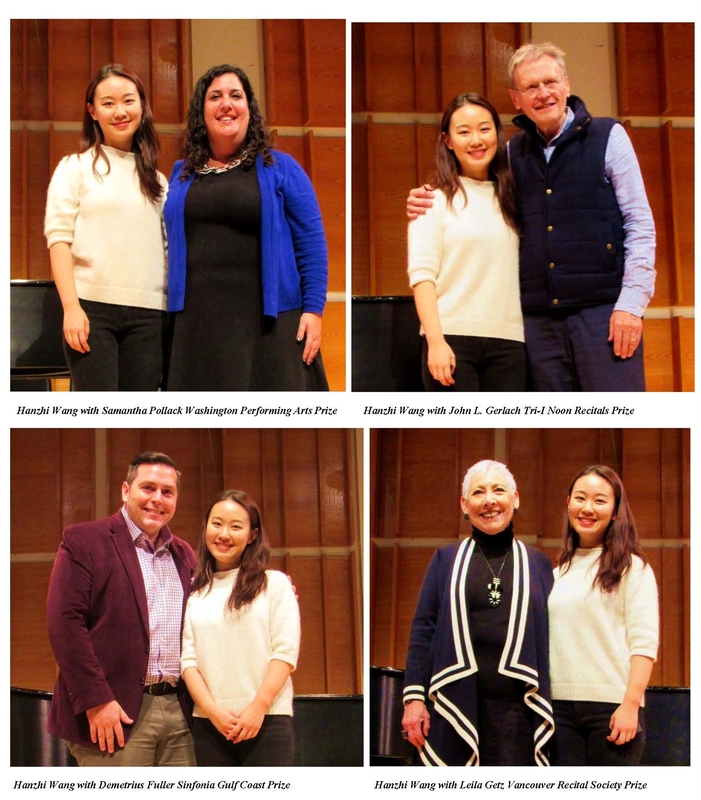 2017, Four First Prize Winner Announced At The 2017 Young Concert Artists International Auditions. 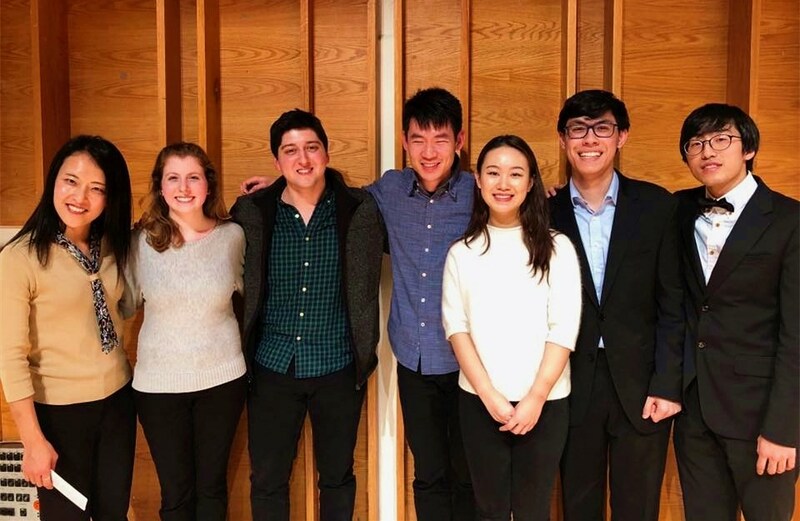 26-year-old Chinese accordionist Hanzhi Wang, 23-year-old Korean pianist Do-Hyun Kim, 18-year-old American/Bulgarian cellist Zlatomir Fung, and the Maryland-based Omer Quartet – violinists Mason Yu and Erica Tursi, violist Jinsun Hong, and cellist Alex Cox were selected from twelve Finalist of the 2017 Young Concert Artists International Auditions in the Final Auditions on Saturday, November 11, held at Merkin Concert Hall. The Auditions drew almost 200 applicants from 30 countries. All 4 winners will be invited to join the Young Concert Artists’ roster – granting access to a minimum of 3 years management services, career engagements, publicity and career guidance – plus coveted recital debuts in New York City and at the Washington DC Kennedy Center for the Performing Arts. This is the first time in the history of the Young Concert Artists International Auditions that an accordionist was chosen. This year’s jury comprised: YCA Founder Susan Wadsworth (Chair), violinists Lynn Chang and Benny Kim, violist Scott Nickrenz, cellist Fred Sherry, accordionist Dr. William Schimmel, trumpeter Gerard Schwarz – and pianists Anne-Marie McDermott and Jerome Lowenthal. The Young Concert Artists International Auditions differ from a competition, as there are no rankings, and any number of winners can be selected – with each candidate competing against a standard of excellence, not each other. Young Concert Artists alumni include: Pinchas Zukerman, Ida Kavafian, Emanuel Ax and Murray Perahia – and VC Artists Paul Huang, Bella Hristova, Benjamin Beilman, Ray Chen, Stephen Waarts and Soo-Been Lee. 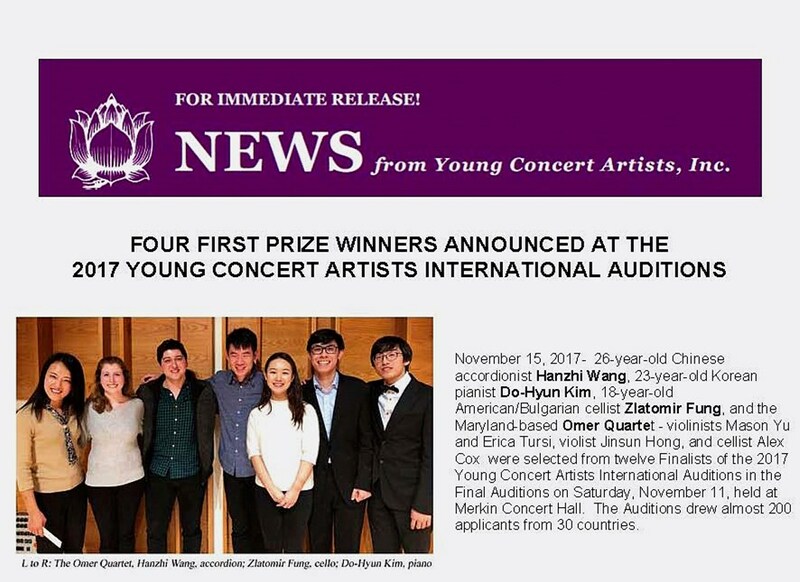 Hanzhi said, “It is such a great honor being one of the winner in the 2017 Young Concert Artists in New York! Congrats to the Omer String Quartet, Zlatomir Fung, Do-Hyun Kim! I'm very excited to be the first accordionist to join the Young Concert Artists big family! I am grateful to everybody in the way who supported and encouraged me! I am joining YCA artist management in New York and I will look so much forward to collaborate with my YCA families in future projects." Hanzhi Wang, born in 1990, is considered one of the young stars of the new generation of classical accordionists. Despite her young age, she achieved great success, performing around the world as soloist and as chamber musician. She is often described as “full of mastery”, “technically impeccable” and “great stage presence”, features added to the innovative musical experience of which she is exponent. She has received numerous awards since the age of 18 as the “Beijing International Accordion Competition” in China and the “klingenthal International accordion competition” in Germany. She won the Arrasate International Competition in Spain in 2013, and the Prize of Class at the International Accordion Prize of Castelfidardo in 2015. In addition to the several tours, she appeared also many times on TV programs. With her unique performances, Hanzhi Wang has become very popular among modern composers. Many of them have dedicated to her works, such as Danish dancer Martin Lohse and British James Black. Noted for inspiring the young accordion generation, Hanzhi has presented lectures and excellent master classes in 7th International Summer Campus at the Royal Danish Academy of Music, Tianjin Music Conservatory of China, Music College of Capital Normal University of China. She was also invited as jury member at the 6th International Digital Accordion Competition of Rome and the International Accordion Festival in Alcobaça, Portugal and the 41st International Castelfidardo Accordion music festival in Italy. 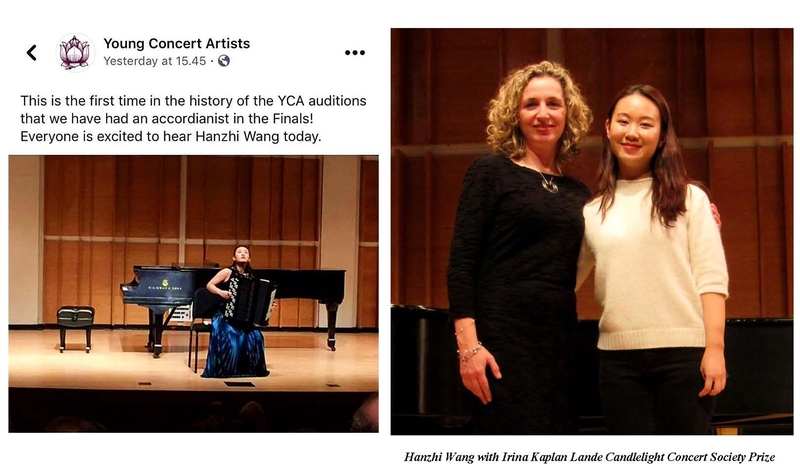 Hanzhi was invited to be a visiting scholar in the Manhattan School of Music in United States and has presented concerts for new music introduction and performance. In 2017 she will release her solo-cd, with works by Danish composers. The CD is called “In the path of H.C. Andersen”, and takes the listener in to the heritage of Danish adventures. Young Concert Artists is a non-profit organization founded by Susan Wadsworth in 1961, dedicated to discovering and launching the careers of exceptional, but unknown, young musicians from all over the world. The organization is dedicated to discovering and developing the careers of extraordinary classical musicians. Winners of the Auditions are selected by a jury of distinguished musicians. The sole criteria are exceptional musicianship, virtuosity, and individuality. The musicians compete against a standard of excellence – not each other. There is no limit to the number of First Prize Winners each year, and the Jury has the right to select none if none qualify. First Prize Winners, of which there can be any number, join the roster of Young Concert Artists, which provides management services, including the booking of concert engagements throughout the United States, publicity, promotional materials and career guidance for three or more years.First Prize Winners are presented in recitals in the Young Concert Artists Series in New York and Washington, D.C.